Faced with growing pressure from educators, Arizona Gov. Doug Ducey announced Thursday his plan to give teachers 20% pay raises by the beginning of the 2020 school year. 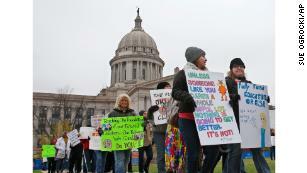 What’s next after Oklahoma and Kentucky teachers’ rallies? Posted in Educators Protest, Uncategorized and tagged "Standing Strong for Public Education", #iBelieve, Accountability, Accountability System, Advocacy, Department of Education, Diversity, Education, Education Funding, English Language Learners, Equity, Every Student Succeeds Act (ESSA), Failing, Failing Schools, Federal Education Policy, HBCU, High-Needs Students, NEAExecutiveCommittee, Pension, Pensions, Public Education, School Choice, State Budget, Students, Tax, Testing and Accountability. Bookmark the permalink.